I love real flowers but they are pricey and die so quickly. The assortment of artificial flowers and vases at Ben Franklin Crafts has really expanded. There are so many choices that I had a hard time deciding on a combination that would bring springtime into my home. I finally settled on the two in the photos. The top one has tulips which always says Easter to me. 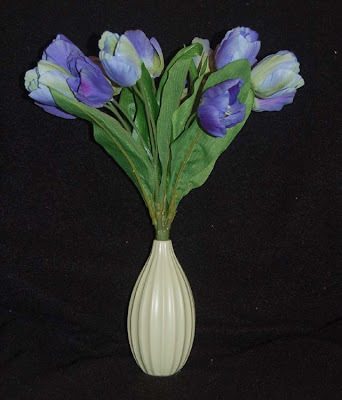 The matte green vase has a nice ovoid shape which gives it a very retro feel and matches the shape of the tulips. 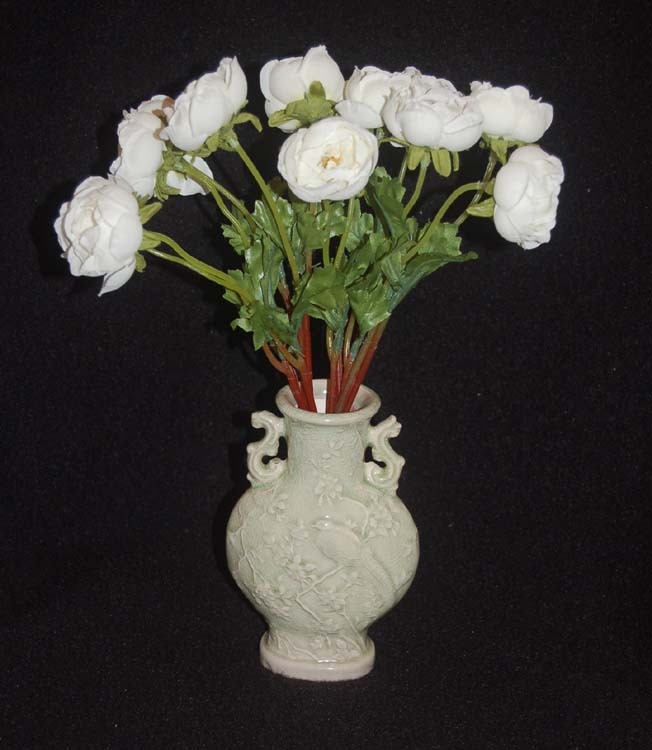 The bottom photo is of ranunculus flowers in a faux antique Chinese vase. If your home decor is done in Asian style, this would really to bring an expensive look at a budget price. Both the flowers and vases now available at BFC are tryly fantastic and affordable. I hope that you'll check out all the new spring items that have come into the stores. Thank you for visiting this site today and I hope that you'll return soon to see what other crafts and purchases I've made recently. Sometimes after I make a project I want to try it again because I have another idea for a different look. Here's the decorated folder purse made using Little Yellow Bicycle paper and their sticker for a closure button. (See a previous post for the how-tos.) The only suggestion I have is to choose a paper that has a design that is not going in one direction (like this one) because then the back of the folder purse will have the design upside-down. 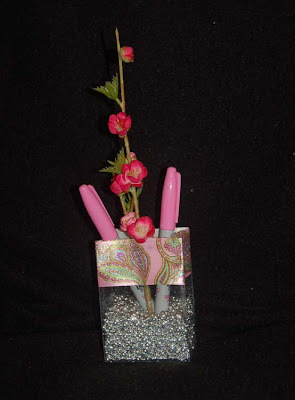 The next second glance project is the bag vase using the mini acrylic dots. 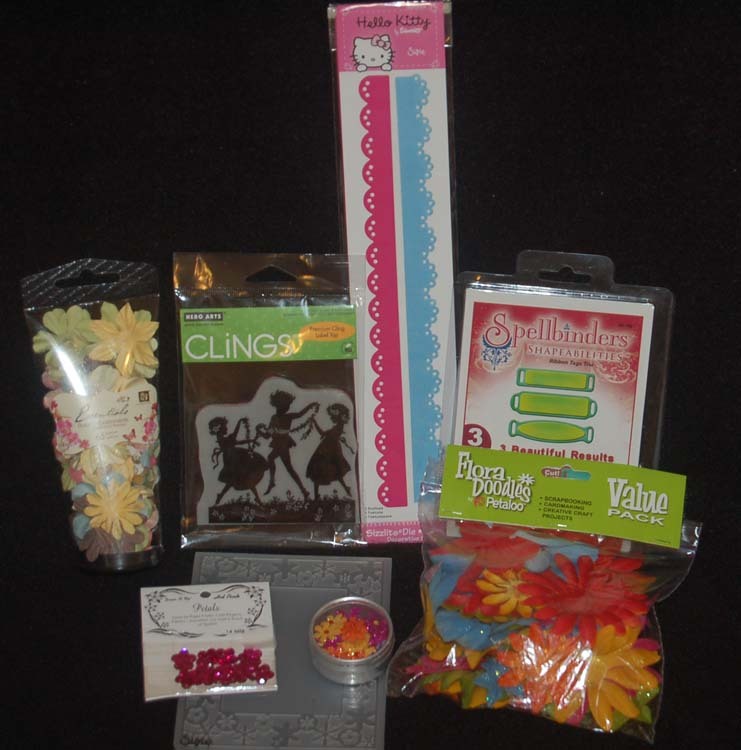 Awhile ago I purchased the cute manicure tools sold at Ben Franklin Crafts (next to the cash register). 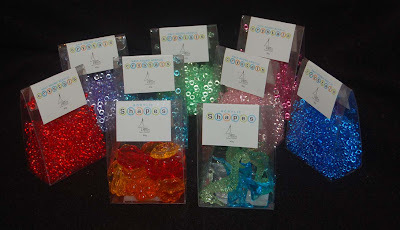 I was planning to give them away as party favors but couldn't think of a way to fancy it up. More recently a sweet young lady gave me some Graphic 45 paper (brownish version) some of which had the same glamour girl look as the manicure tools. By framing just a small piece of the paper I was able to use it to cover up the Sierra Pacific label on the bag. I also added extra acrylic dots so that the manicure tools would stand up taller. The black and white version is actually the back of the vase which was made using a rubber stamp image and a fancy silver paper for framing. I think this version of the project would be great as wedding shower favors especially if you use a stamped wedding image. Anyway, I hope this post has given a glimpse into the reason sometimes I have a blank expression and seem to be lost in thought everywhere, especially at Ben Franklin Crafts. Hopefully, exercising the creative parts of my brain will keep me young! Thanks for reading through this very long, rambling chatterblog post. This project was a product of necessity. I never seem to have a post-it handy when I need one, especially when I am not at home and I need to mark a page of something I'm reading. I used the leftover paper from the last project (it was two sided Imaginisce) , a 7/8"x 2-7/8" post-it page marker pad, and Dandelion Design rubber stamps. I was able to easily make this post-it booklet portable by punching a hole in the booklet with a Crop-A-Dile Big Bite and adding a jump ring (I used a 10mm jumpring but 12mm would be better.) and a Darice lanyard hook (in metallic pink). 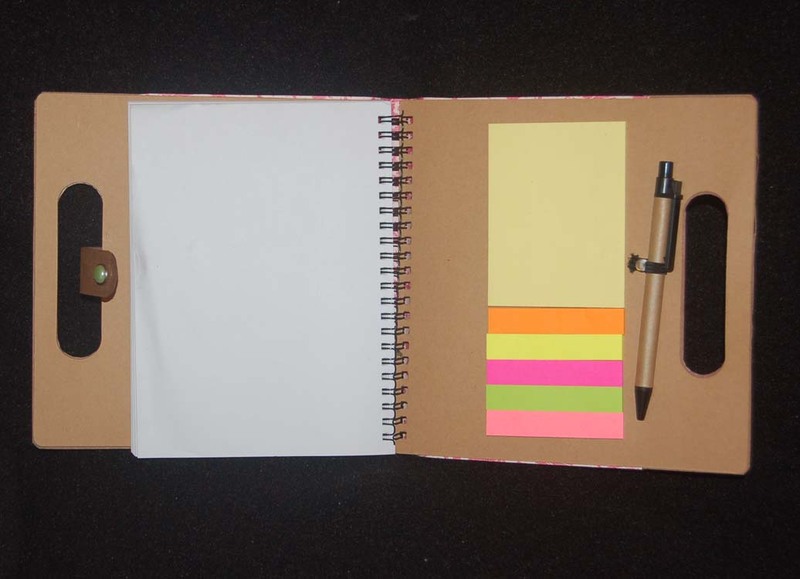 Now this little post-it booklet can be attached to my purse, folder, laptop, or cell phone. 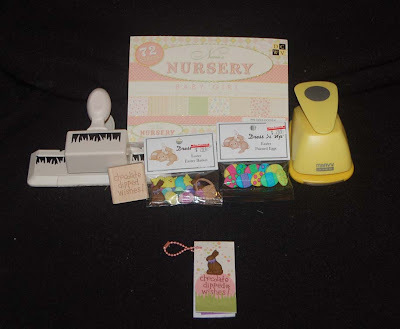 The Dandelion Design rubber stamps used were last year's editions (I only inked up some of the words on the stamp with words) but I've seen the new sets of DD non-wooden stamps at Ben Franklin Crafts and I think the Girl's Day set would be perfect for this project. I'm going to get the set tomorrow. I hope they haven't all sold out. I already missed some of the other sets...hopefully they'll get restocked soon. Ah, Friday....BFC shopping day! See you there! Thanks for visiting this blog site and leaving your lovely comments. I appreciate the feedback. When I first saw the Sierra Pacific undecorated folder with notepad, pen, and post-it tabs, I knew that I had to turn it into a handbag. However, due to trips I put it on the shelf and only when I found the Imaginisce Garen Party Brambleberry Blossoms paper did I get inspired to make the project. Because the paper looked like cherry blossoms I thought that the notebook purse would be a great Girls' Day (March 3rd) gift. I started by cutting the printed 12x12 paper into an 8x12 piece. Using Merikan tape ( the wide width), I adhered the paper to the folder, wrapping it around the bottom to cover the spiral edge. 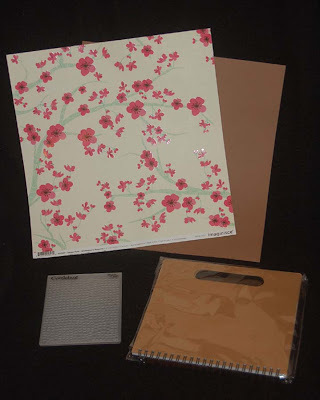 Next I used the Cuttlebug embossing folder to impress the alligator-look on the brown (walnut) Bazzill 12x12 paper. (You don't need to emboss the whole sheet.) Cut two 8"x 2-1/2" pieces and use the folder to trace the 'handle' on each piece. With a craft knife and ruler cut the sides of the two oval holes and use a scissors to cut the rounded parts of the holes. (Cut carefully so that the ovals can be used as the closure strap.) 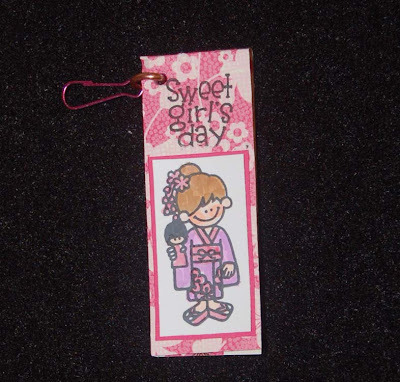 If desired all the parts can be rubbed with brown ink (Distress Ink) to highlight the embossed design. With Merikan tape adhere the 'leather-look' pieces to the purse folder. Finally add a brad to the front of one of the cut out straps and tape the other strap to the back to cover the brad fastener arms. Put an adhesive Velcro dot under the decorative brad end of the strap and tape down the other end in the back. If you don't have an embossing folder you can use faux leather paper or crinkle your own before adding distress ink. Also a button would work instead of a brad. This simple project will make good craft fair items because the undecorated Sierra Pacific product from Ben Franklin Crafts costs only $2.99! 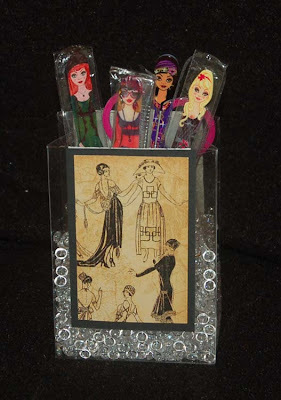 You could also make a fancier version with a monogram or hand colored stamped image for a special friend. Well, go make some smiles.....craft! 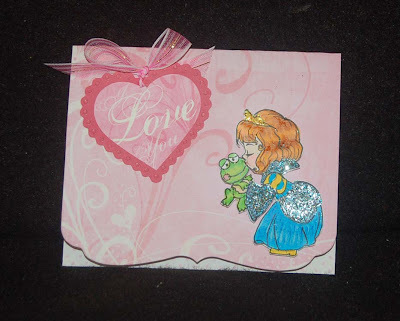 I just finished this card and then I saw the Hallmark channel movie titled, Smooch. It was about a little girl who kisses a frog and thinks it turned into a prince for her unmarried mom...so cute! Anyway, I made this quickie card for my husband who has always treated me like a princess and imagines that he is more like a frog than a prince. But I assure him that I would never, ever kiss a frog no matter what he promised. I only hope that it doesn't happen in reverse because I am content with my prince and don't want to wake up next to a frog. Hope you've found your prince for Valentine's Day.....if not, we have a pond with lots of frogs we want to get rid of....Happy Love Day! P.S. If you do use the DieCut Cardmaking paper from the K and Co. pad you should cut a little off the top so that when you fold it it will fit into a standard envelope. What I like about this paper pad is that the bottom edge is fancy and both sides of the cardstock are printed. 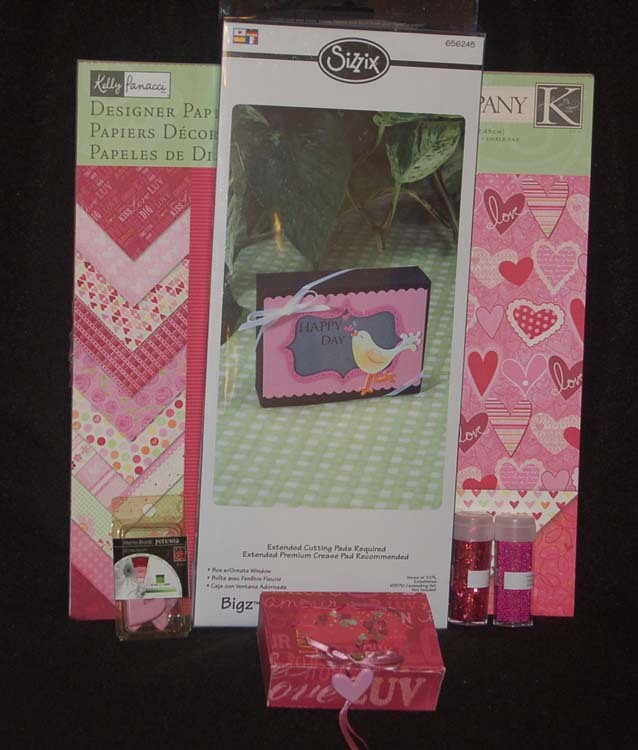 If the pads haven't sold out, you will find them and other Valentine items on sale for 25% off at Ben Franklin Crafts. HAPPY VALENTINE'S DAY! CARIN AND REGINA! Going on a trip to the CHA (Craft Hobby Association) show and coming back one week before Valentine's Day makes it hard to create everything before the 14th. I wanted to give something small to our hard working office 'daughters' but didn't have the time to make an elaborate card so I decided to just do fancy labels over the bags. I already had in my stash some stamped and colored 'The Greeting Farm' images ( I stamp lots at one time and color in front of the TV when I feel like it). 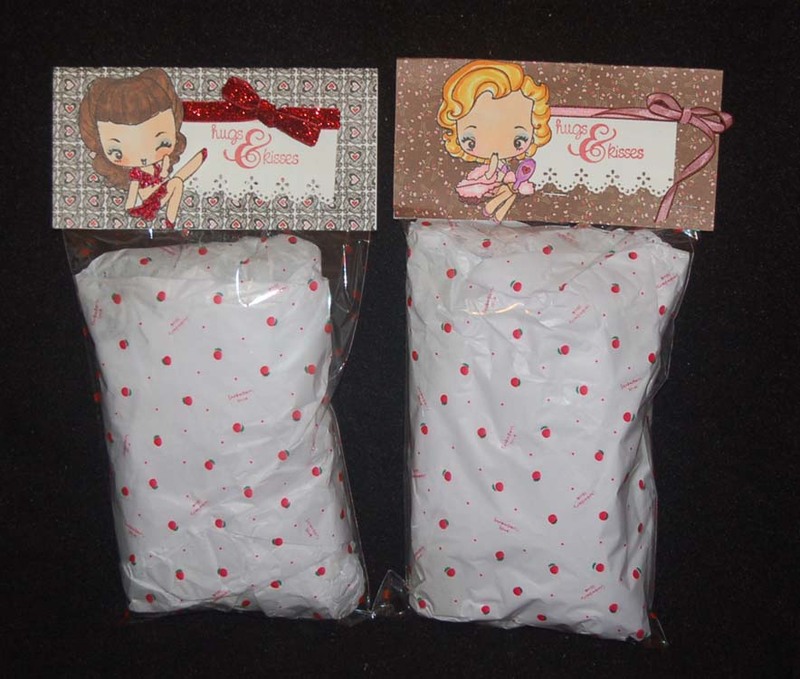 It was simple to fold the Bo Bunny 6x6 paper in half and staple it to the Heiko cellophane bag. 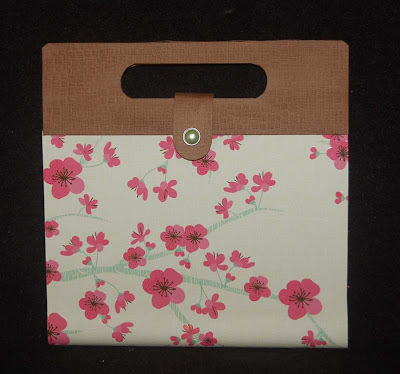 (Ben Franklin Crafts has lots of new bags including a cherry blossom one which would be perfect for Girl's Day.) 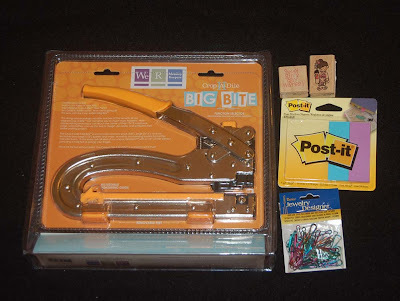 I used the border punch that comes in the Martha Stewart set (which includes a corner punch so you can punch completely around a paper if you desire) and a $1.25 Studio G stamp. Don't forget to check out the Valentine supplies which are now on 25% off at BFC. 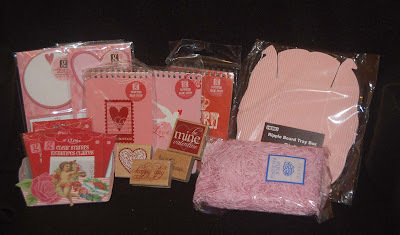 Shopping now for next year means I get great bargains and a head start on next Valentine's Day! I bought the Martha Stewart package of heart-shaped treat holders and thought they might come in handy if I should run out of time to make them from scratch and then I had an idea. 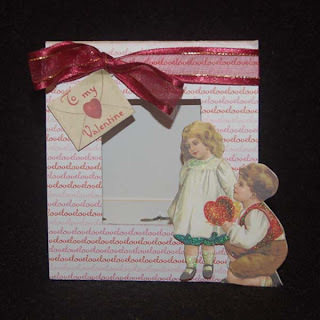 What if I put them on a card, filled them with one special hand-decorated Valentine cookie, and delivered them by hand? 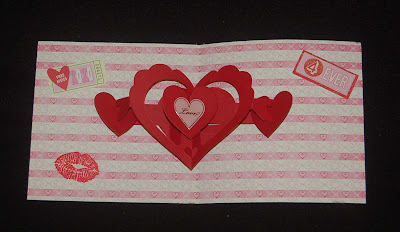 Then I remembered I had a Sizzix pop-up Valentine die that was just begging to be used. The paper pop-up seemed rather complicated, but it wasn't because the instructions are right in the box. It does look impressive when it is finished. I think I'll send it to my son in college and not tell him how I made it. That will make him think I'm a paper genius. 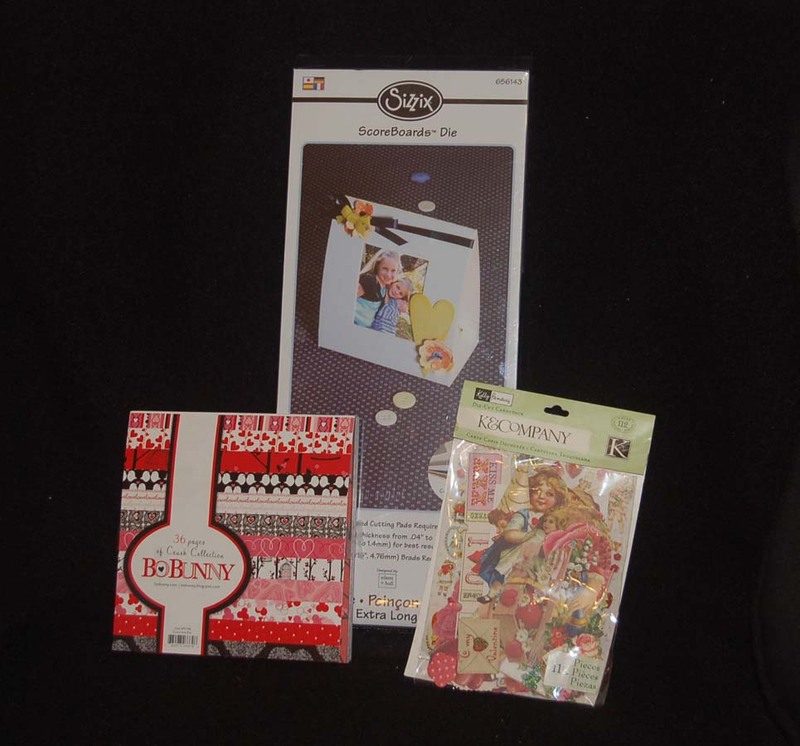 Some of the supplies used for this card are featured in the bottom photo. It really is easier than it looks. Give it a try. I'm sure you'll be pleased. Happy Valentine's Day! 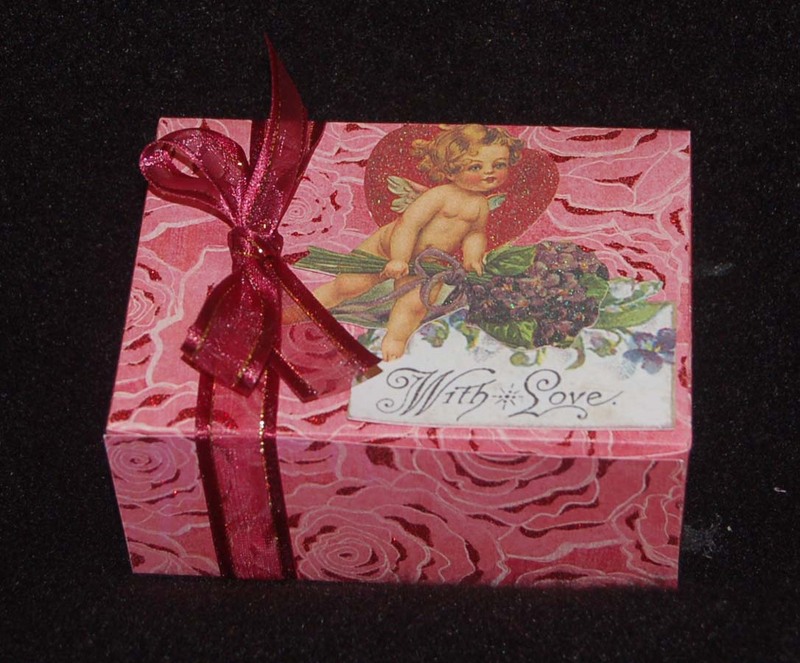 Isn't this the sweetest Valentine gift box? I love the old-fashioned look created by the K and Co. die cuts. 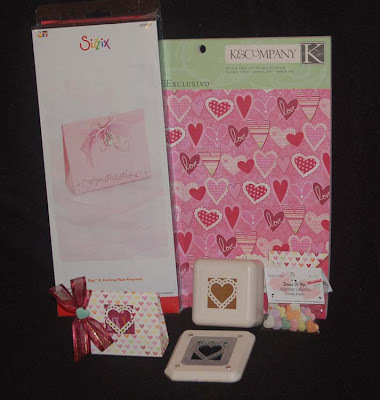 Sparkly K and Co. cardstock from the 12x12 specialty paper pack was cut with the Sizziz Bigz box die. (See bottom photo.) Because the die is cut twice, it doesn't require a Pro Machine to form a very adequate treat box. 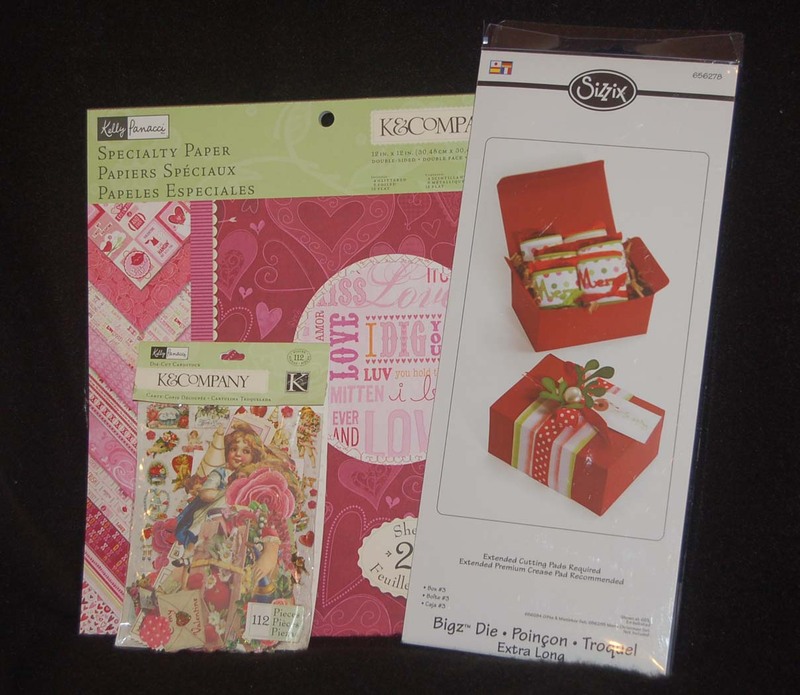 It is so easy and quick to make multiples using the Sizzix dies that you will become addicted to die cutting. 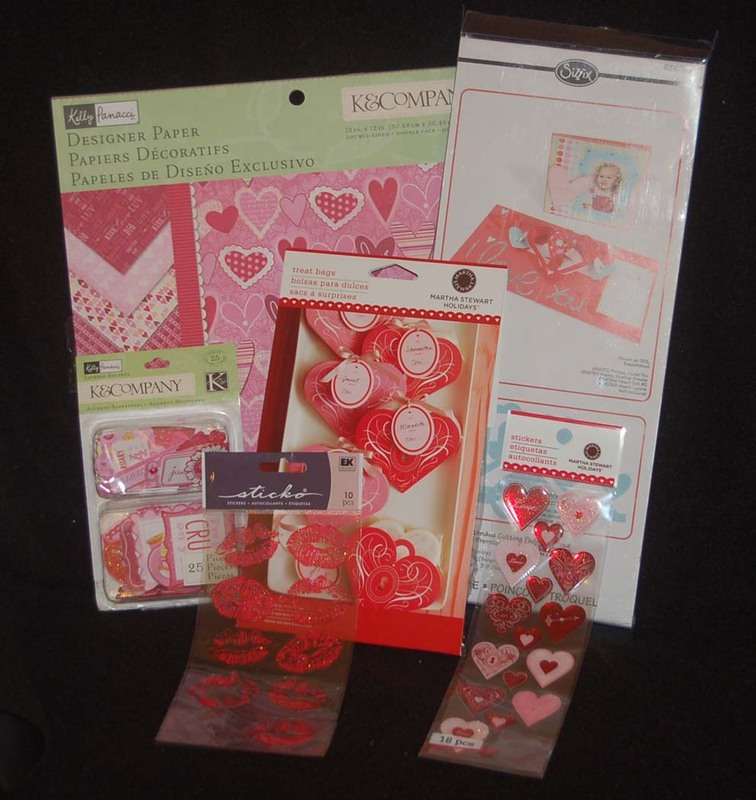 Please come to Ben Franklin Crafts for all your Valentine supplies and to use the die cutting machine for free if you purchase your paper from the store. Have a sweetheart day! Hugs and Kisses! Do you want to make a cute gift basket for a friend/co-worker but you don't have a lot of time or money? Here's what you could do. I found a set of 10 paper corrugated (trays) baskets (see bottom photo) from Heiko (sold at Ben Franklin Crafts) and added a few embellishments. In just minutes I was done with dozens of them. I padded the baskets with fine shredded colored paper (also available at Ben Franklin Crafts) and filled them with Studio G products (only $1.25 each). 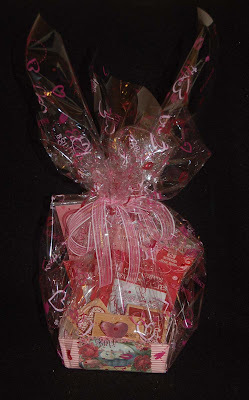 Finally the whole basket was wrapped in cellophane and tied with a sheer ribbon...Voila! You're done and it didn't cost a fortune. 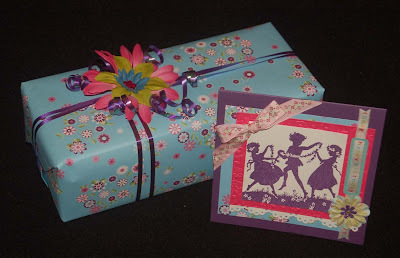 When I have the time, I love to make a birthday card that coordinates with the gift wrapping. Both the paper and Hero Arts Cling stamp were my inspiration. 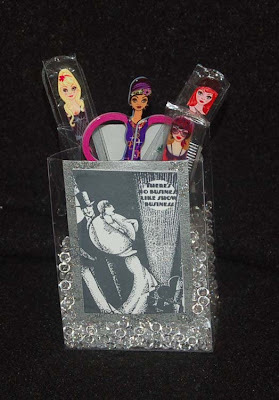 I started by stamping the children dancing using Victorian Violet Brilliance ink on white cardstock and embossing it with clear crystal embossing powder and a heat gun. Next I used a flower embossing folder (from a Hello Kitty set, I think) to impress the pink cardstock. 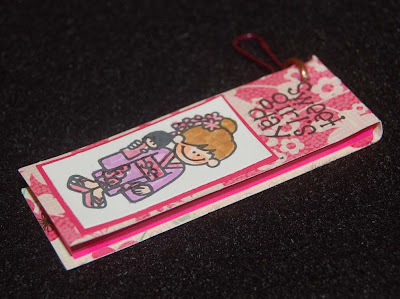 The Sizzix die was used to cut the eyelet lace paper strip but you could use a border punch instead. The Happy Birthday ribbon was strung through the Spellbinder cut label and then everything was taped or glued in place. The 6x6 card was further embellished with Essential, Dress It Up , and some other small sparkly flowers I purchased from Ben Franklin Crafts. The really gigantic flowers used on the gift wrapping are Flora Doodles by Petaloo. Using an artificial flower instead of a bow makes the gift easier to wrap for mailing and I glued the flower to a large paper clip so the recipient can reuse the flower on another gift or craft project. I think my sister will appreciate the card because she also grew up in the 'olden days' when we actually did the Maypole dance for May Day.....sigh, those were sweet, innocent times. This picture frame filled with a photo of a loved one would be a perfect gift to send in the mail because it can be flattened by removing the brads. It is also super easy to construct since the basic frame is cut using a Sizzix frame die and even the decorative paper was cut using the die. I only covered the front of the frame but you could do the whole frame. The bottom photo shows some of the essential supplies needed for this project. 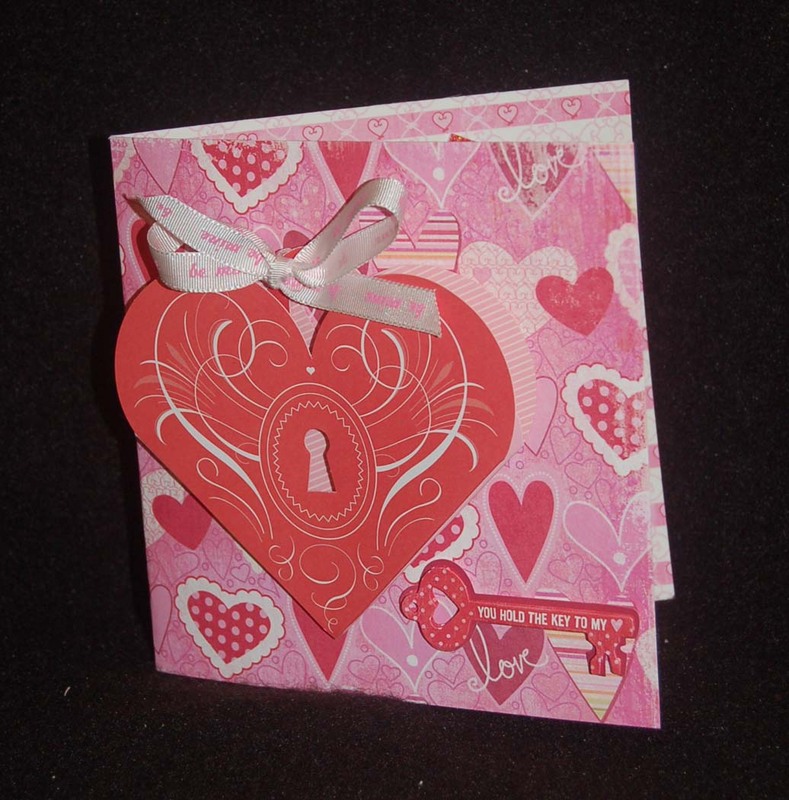 Bo Bunny produced two booklets of 6x6 Valentine papers this year, which are sold at Ben Franklin Crafts. 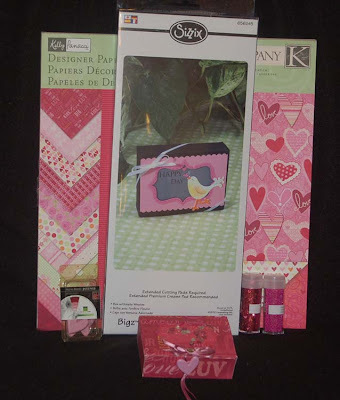 I think you'll find that the package of K and Co. vintage-look Valentine die cuts are an invaluable craft embellishment, which will add instant charm to all your projects. Oh yes, the Sizzix frame die is for matboard or chipboard because any paper or cardboard that is too thin will not stand up and the die will cut completely through it. Also be sure that your brads are long enough to go all the way through the two thicknesses of chipboard. I had some perfect heart ones but they were just a little too short and I can't find my other Valentine brads so I'm off to Ben Franklin Crafts again. Hooray! Shopping! Valentine's Day seems to bring out the urge to make treat boxes. These days my waistline would appreciate a box of embellishments more than brownies, but I must say this box is just the right size for a single luscious brownie square. I started with a half sheet of cardstock from the Valentine K and Co. Designer Paper pad. 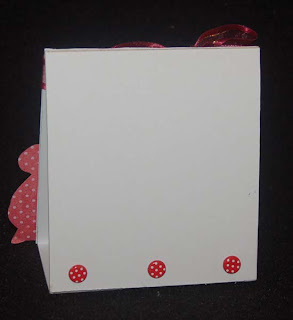 Using the Sizzix die in the photo made making the box with the shaker top a cinch to make. All I had to do was tape acetate behind the opening, line the opening with foam tape, fill the window with Martha Stewart glitter and teeny no hole beads, and affix a piece of cardstock behind the window. A bow with long ties on the top of the box and a large heart brad on the front form the simple closure. This second treat holder was also a quickie. 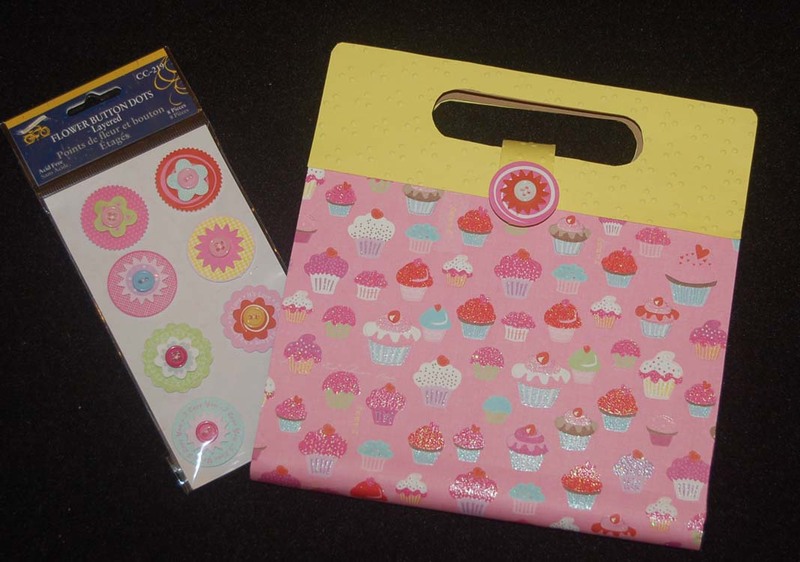 I reversed the other half of the 12x12 cardstock and used the other Sizzix die to cut the bag with a tab. After I assembled the bag I decided that I wanted to cut a window to reveal the treat. Of course it would have been easier to use the anywhere Martha Stewart Valentine punch before I taped the bag together (LOL) but it wasn't too hard to place the bottom of the punch in the bag (put something flat like a spool of jewelry wire under the punch) and attach the magnetic top half of the punch. Finally, a Dress It Up button was attached to the bow using a piece of wire and then it was glued to the treat bag. 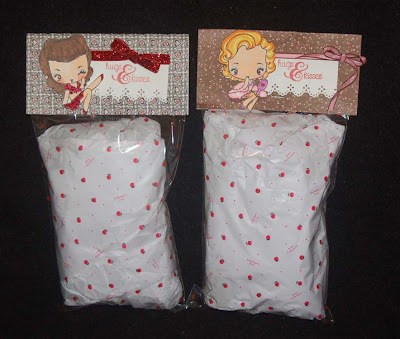 If you need lots of treat holders but you don't have lots of time, these two die cut ones are your easy solution. Remember: If you purchase cardstock from Ben Franklin Crafts, you can use their machine and dies. Now isn't that a treat!